RSVP set for the Tango Wedding Invitation is 4 bar size (5"x3.5") RSVP card is 100% recycled cotton and silk rag with 100% cotton envelope made by Crane in USA. If you are printing, you get 4 cards on the sheet we send you. (Templates included). Paper is cut to size (3.5 x5 inches) if we print for you. ONLY 75 INVITES LEFT We are not going to import the red velvet paper we make this design from. Sorry!!! Vintage Style with Modern Flair, this eco wedding invitation will impress your guests with tasteful drama. Flocked cotton rag paper: elegant brocade pattern. DIY in Style. 100% recycled rag papers, cotton and silk. 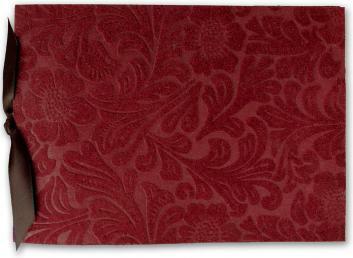 Flocked red brocade pattern booklet invitation. DIY assembly. Diecut pocket for rsvp set and enclosures. Diecut binding holes as scored for easy folding and assembly. 100% COTTON, including Crane envelopes. PAPER FACTS: Portfolio wrapper made from recycled cotton rag handmade paper from India. Diecut and letterpress printed here in Pasadena. Inside invitation sheet made from recycled cotton rag and silk handmade paper. Envelopes are 100% cotton and made in USA. A romantic booklet invitation that opens to a wide landscape of 14 inches. Booklet Cover:Die-cut and scored portfolio wrapper made from handmade paper with flocked red brocade pattern. Mailing Envelope:Cotton Rag white A7 envelope with baronial (pointed) flap. Ribbon:Half yard of chocolate brown satin ribbon. Extra DIY papers:MS Word printing templates if you plan to print these yourself.